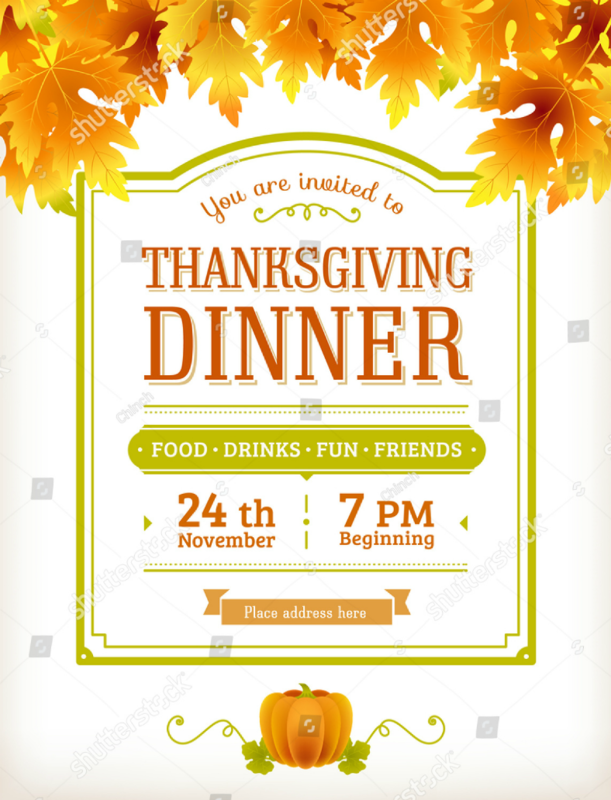 Thanksgiving is just around the corner, with little over a week until this joyous occasion, the timing of talking about invitations for a Thanksgiving party is just as perfect. When hosting a party or any kind of event, you will often need to make people aware of this event for it to be attended, and while the ancient times had messengers to make announcements in public places, we don’t do that anymore. What we actually do nowadays is distribute flyers, put out posters, or for more intimate events, we send out invitations to specific people. Now, if you are planning on hosting a party for this coming Thanksgiving, then look no further since we have an entire collection for you. 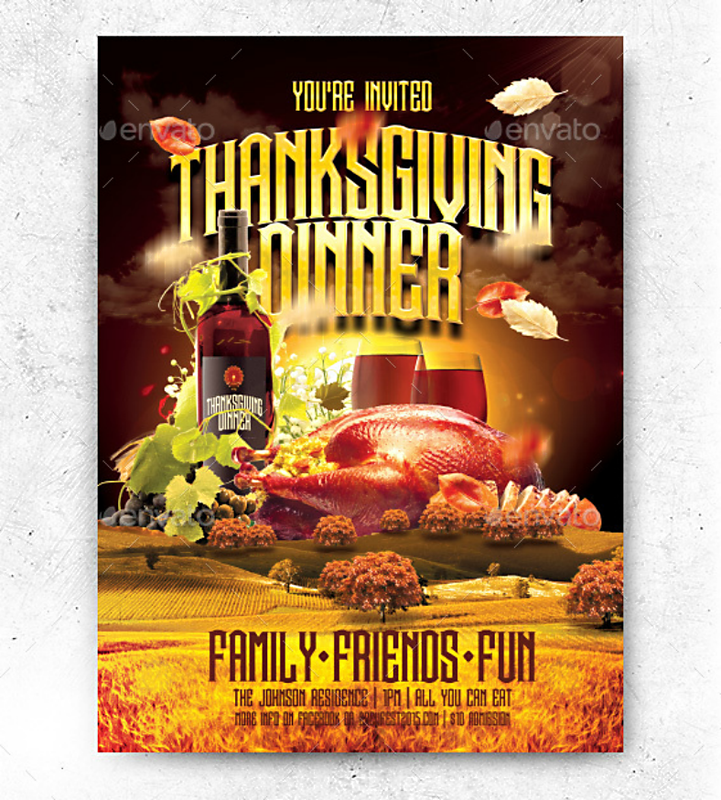 Below are some of the best Thanksgiving party invitation designs that you can ever find on the Internet, and we gathered them up so you won’t have to. Just to give you a heads-up, many of these invitation designs involve an image of a roast turkey, so keep a handkerchief or a napkin ready because your mouths just might water from that wondrous sight. 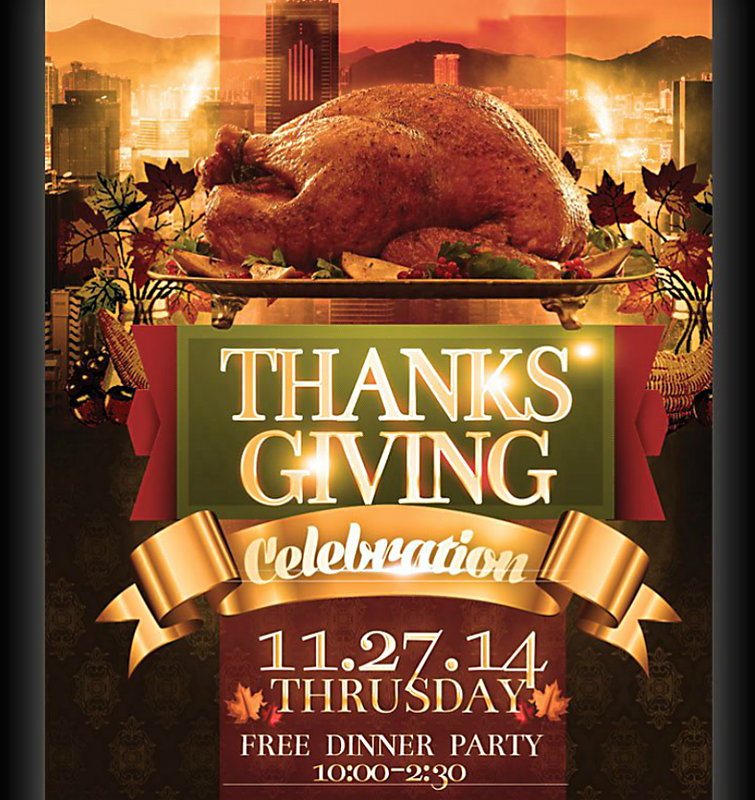 And finally, to keep you from waiting, feel free to scroll down to see the Thanksgiving invitation design yourself. 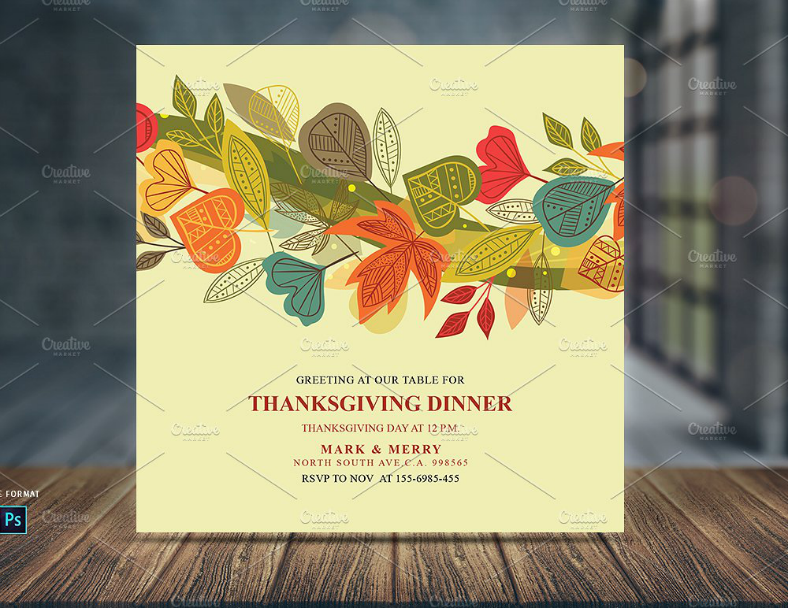 Let’s start with this simple yet still artistic Thanksgiving invitation card design, which doesn’t have too many elements, other than the two layers and the ornate decorated borders of the top layer. If you look closely, the bottom layer also has subtle details added to it. 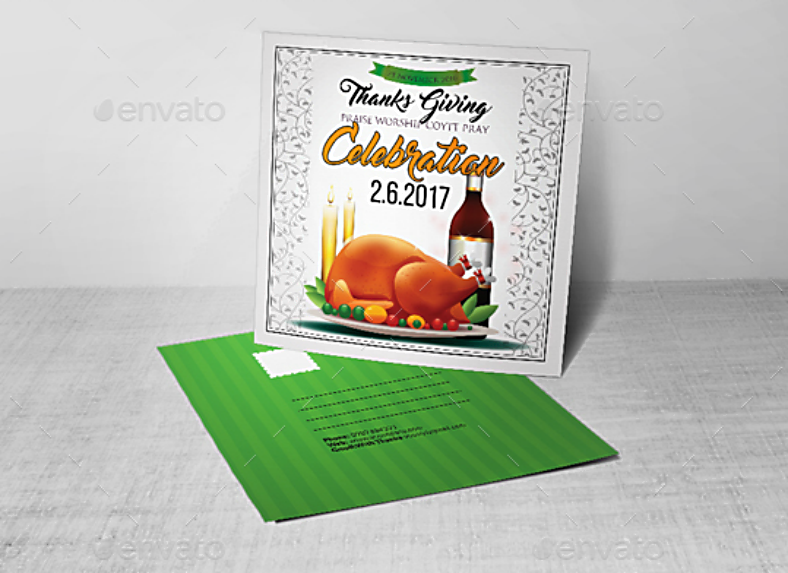 This invitation design is perfect for Thanksgiving celebrations in Canada as evidenced by the maple leaf patterns in the background. Why stick to the traditional portrait-sized formal invitation design when you can always go for something else to make your Thanksgiving invitations stand out? 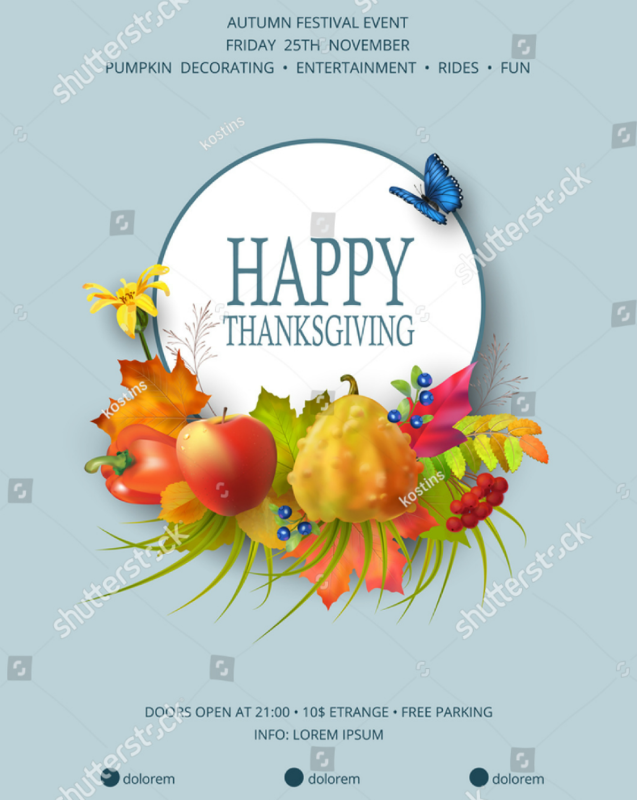 For the design shown above, it shows an image of what you can usually find on the dinner table during Thanksgiving, which is food, and lots of it. What makes this invitation design unique, you ask? Just look at that shape. 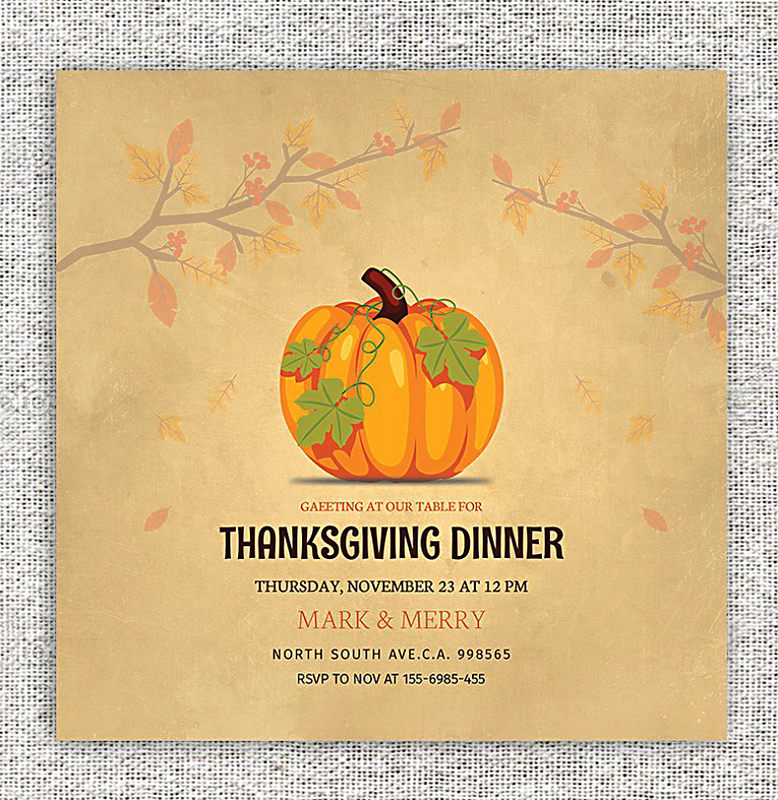 This Thanksgiving invitation design uses a square shape, which is not only unique but also portable. What Is Thanksgiving, When Is It Celebrated, and What Is the Relevance of Celebrating It? Thanksgiving is a national holiday that is observed in the United States and in Canada. This occasion traces back to the country’s historical roots in both religion and culture, and it has even been celebrated as a secular holiday for these two countries. There is no definite date for the celebration. The month in which the occasion is celebrated is even varied between the two countries that celebrate it. In the United States, it is celebrated on the fourth Thursday of November, while in Canada, it is celebrated on the second Monday of October. 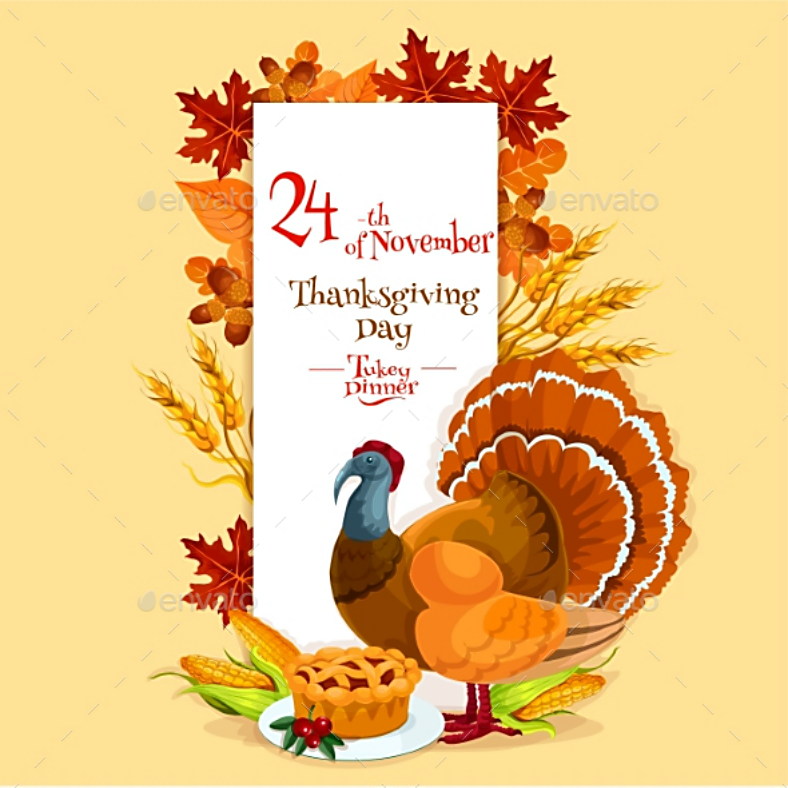 Thanksgiving is being celebrated since it commemorates the country’s act of expressing gratitude from the successful harvests, and that feasts were held at the culmination of the harvest season. During these feasts, people have often showed their generosity and shared their gathered food with the indigenous people around the area. Come to think of it, the act of celebrating Thanksgiving by today’s people very much mirrors the feast that the ancestors held for their good harvest. 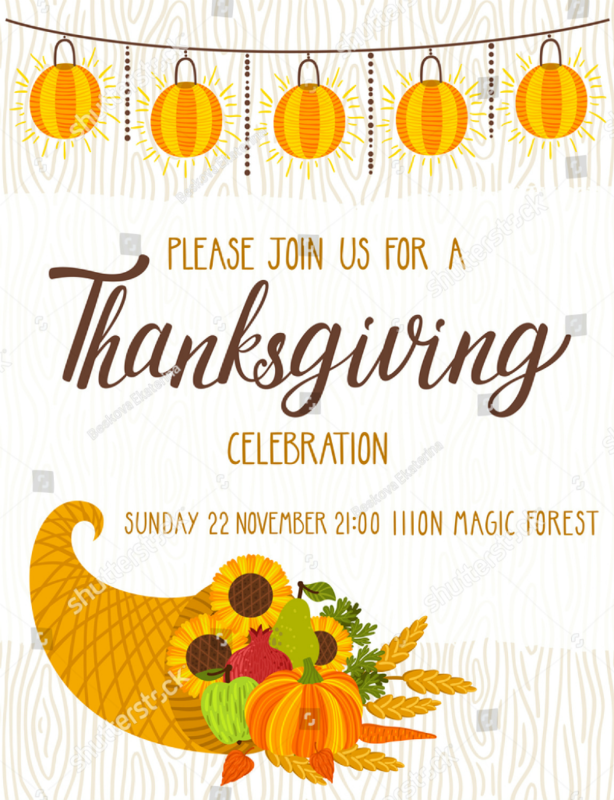 Here is a Thanksgiving party invitation design that just screams minimalism, it leans so much on simplicity that it works perfectly regardless of the color used or the size of the material that this design is being printed on. This invitation design certainly does not try to beat around the bush with its features, and simply wants to let the invitee know what this is about, and in an artistic way as evidenced by how some of the text are being written. 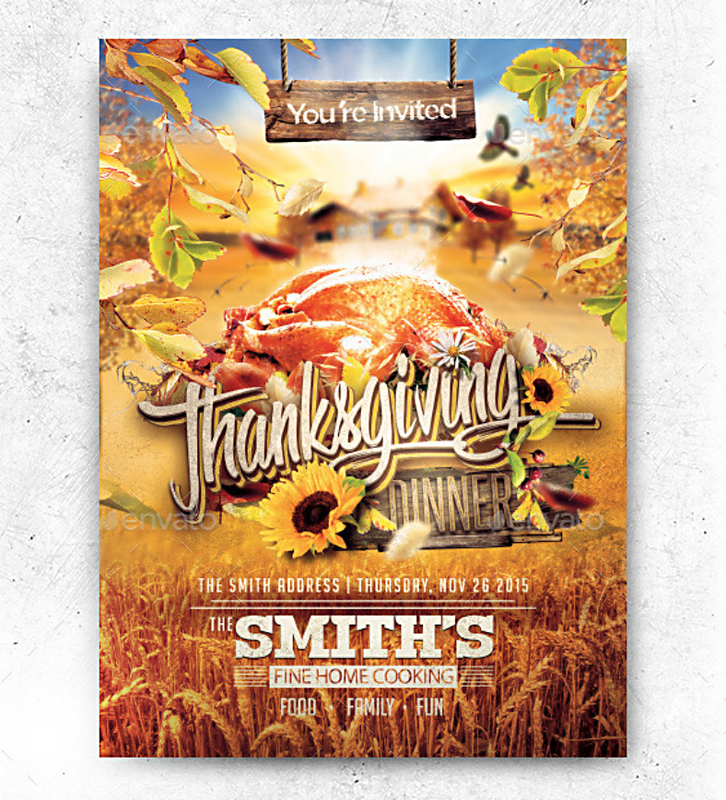 If you like your invitations to be simple but effective, why don’t you try using this Thanksgiving invitation design? The roast turkey is the most common dish being served during Thanksgiving celebrations, and it originated when Governor Bradford wrote about how colonists frequently hunted turkeys during the autumn season of 1621. Also, the turkey is also being considered by many colonists during the time to be a unique kind of bird. After President Abraham Lincoln declared Thanksgiving as an official national holiday in 1863, the roast turkey also became the Thanksgiving celebration’s official meal of choice for Americans. 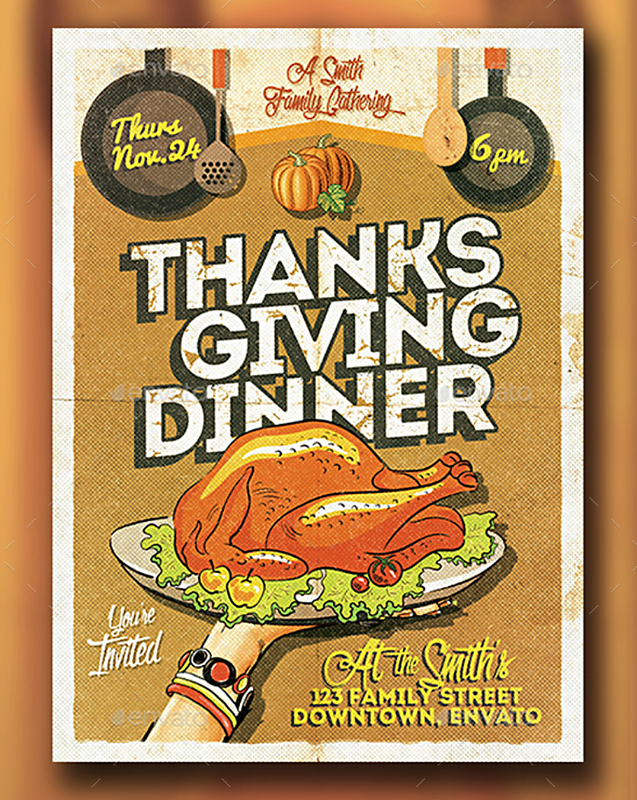 For the invitation design above, it clearly shows an image of a mouth-watering roast turkey just waiting to be served. The celebration of Thanksgiving actually dates back to the early 1600s during the autumn season when the colonists in Plymouth shared a harvest feast with the native Indians from Wampanoag. The feast was organized by the governor of the Plymouth Colony, who also happened to be the founder of the said colony, William Bradford, after the Pilgrims’—a term used to refer to the people in Plymouth—first successful corn harvest. During this time, the colony called on a group of Native American allies to join them in their celebratory feast. And this historical event has been remembered by the Americans as the very first Thanksgiving celebration. Here it is again, an entire roast turkey placed on a plate and about to be served. 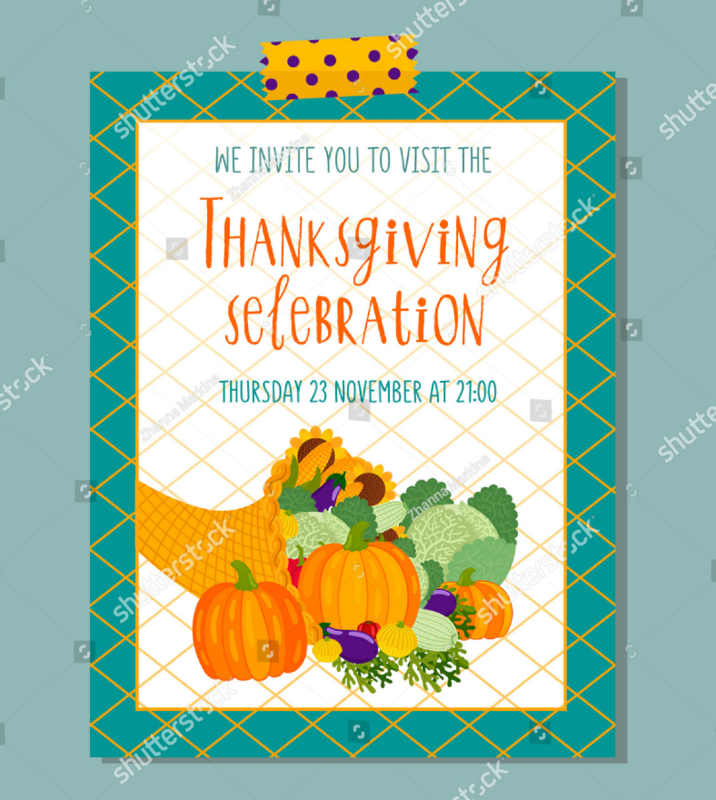 But unlike the previous invitation design that we have just shown you, this one does not use an actual still image but an illustration of a roast turkey. But nevertheless, even the illustration shown above is enough to make our mouths water and our stomachs to make gurgling sounds. If you want to share that feeling with others in order to entice them to come to your party, then don’t hesitate to use this event invitation design. What Is the Importance of Using Invitations? Invitations serve as the formal document for notifying people that they are being expected to a particular event. Aside from just letting the invited person/s that they are being expected, an invitation also provides them with the necessary information regarding the What, When, and Where of the event. For intimate events, the invitation can also serve as an instrument that an invitee must show to the ushers of the event before they are allowed to enter the premises. An occasion that is worth celebrating should always be celebrated appropriately. It should involve a lot of food and drinks, as well as a lot of happy faces. For the invitation design shown above, it clearly emphasizes the food and drinks with its enormous sizes, but what’s great about this design is the effective use of the warm hue that is very inviting and assures the reader that this party is indeed going to be fun. 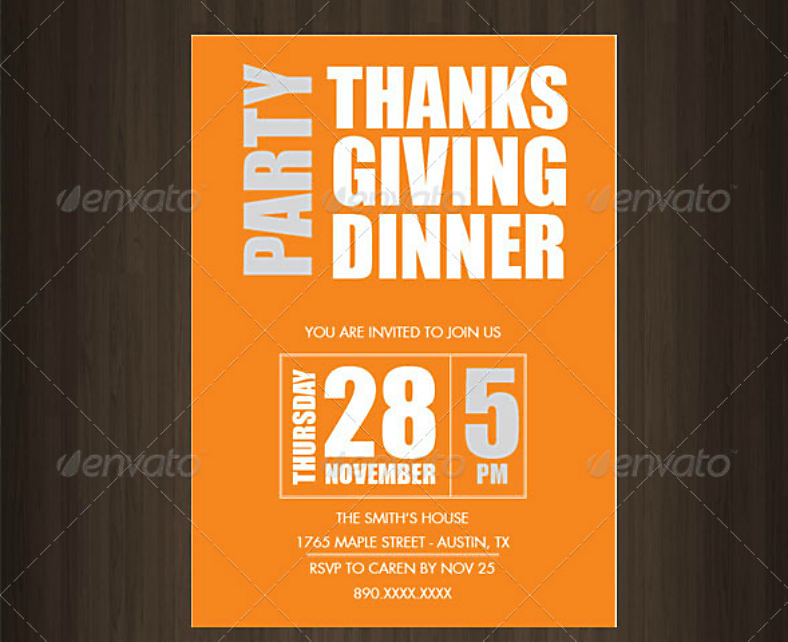 If you feel the same way from looking at this design, then try this out for your own Thanksgiving party invitations. What Are Some Tips When Making an Invitation? Before even starting to make an invitation, always know who you want to invite and list them down on a sheet of paper so you can also determine how many copies of the invitation you want to print. While you can always write the details down in narrative or letter format, this method may take time. What’s important with invitations are the details that answer the What, When, and Where. Therefore, provide the invitees with information as to What type of event they are being invited to, When the event will take place, and Where it will be held. Encourage the invitees to arrive at the venue earlier than the indicated time on the invitation. Include an RSVP on the invitation and specify a deadline for the response, which is usually two weeks before the date of the event. Then again, send your invitation at least four to eight weeks prior in advance. This way, it not only gives you enough time to prepare for the number of attendees to your event, but it also provides your invitee enough time to do a rain check whether or not they have a scheduled appointment on the date of the event. To help you out even more, you may want to check out our list of steps on how to make party invitations. Now that you have finally reached this part of the article, where we start to wrap things up, we just want to ask you, which invitation design from the gallery above was able to work for you? 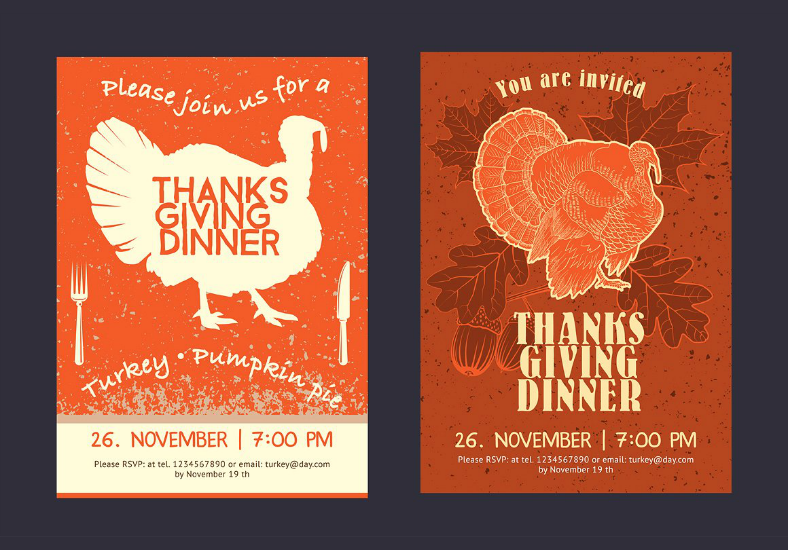 We hope you were able to pick at least one of those designs that you want to use as basis for your Thanksgiving invitations. These invitation designs have been carefully chosen from among the best ones all over the Internet, and from reliable websites, and not to mention that they were also contributed by some of the world’s most creative graphic artists. 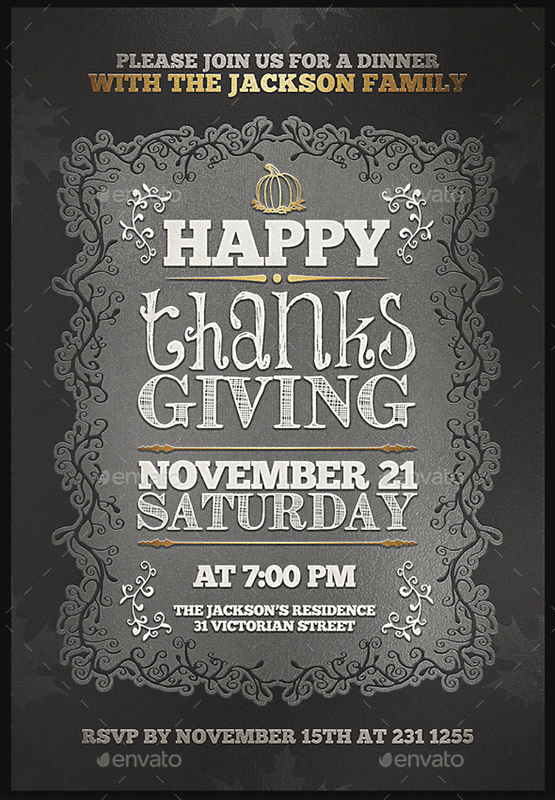 Many, if not all, of these Thanksgiving invitation designs are in vector format, which makes them not only fully editable but also easy to work with since they are able to retain their quality even after editing or resizing. In relation to being able to stay sharp, you won’t need to worry if you choose to have these designs printed on large mediums. If you are in need of invitation designs, don’t hesitate to download one or more from this amazing collection. Doing so can be done by simply clicking on the download or buy now button, but before you react on the “buy now” part, there’s nothing to worry about since you can download these designs without spending a lot. In fact, you will be getting a lot more that what you are actually paying.